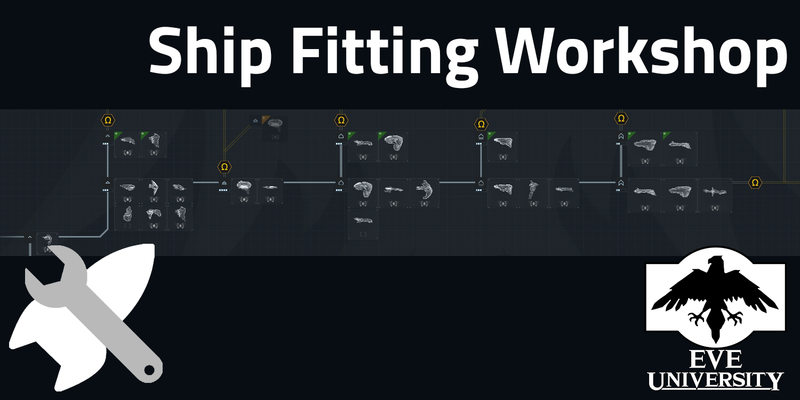 Many say that ship fitting is a game of its own in EVE. Well, I agree. It's complex, stimulating, nuanced and just so much fun if you're anything like me. And well, if you're playing EVE Online, I'm willing to bet you're at least somewhat like me. Sorry about that. This is not your run-of-the-mill class. In this class, we only have a short 10-minute "lecture". In the segment, I present one advanced concept involving ship fitting (which one? you'll need to attend: it changes every time ;) ). Then, the class becomes much more free-form: I will (hopefully) be joined by a co-instructor, and we'll propose you some "fitting challenges" to flex your theorycrafting muscles. Some fitting challenges are more like "exercises", where you need to find the solution to a fitting question that we'll give either using good fitting practices... Or by using totally unorthodox ones. Most challenges, however, are in the form of "how would you solve this problem?". Here, the goal is just to come up with something, and discuss why and how you got to that choice. We all learn from each other, and usually even me and the other instructors gain new knowledge! Be advised: This is an advanced class, and one that relies heavily on direct participation of attendees. It is not the goal of this class to teach you how to fit your shiny new ship, at least not directly. If you just want to listen in, you're more than welcome, but I encourage you to try and participate. The environment will be very inclusive, and if you were to just listen, you'd mostly hear the sound of churnin' neurons while people are fiddling on PyFa. I thought of this class especially for the people in North 'Murica, since I'm normally active in EUTZ only. I will probably have another edition of this soon-ish during EUTZ (on a weekday) and even AUTZ. Stay tuned! Additional notes: If you like theorycrafting and want to host or co-host this type of class, let me know and I'll be happy to help. Also, I'm bad at Photoshop, so if you have a better idea for the class logo, you're more than welcome to help. Should you have any other questions, ask away in this thread! Last edited by Kyle Hargrove on 2019.01.26 21:58, edited 2 times in total. Do attendees need fitting knowledge? I barely know the basics. Hey Shauny! Sorry for the delated answer. I think you'll need at least a bit of fitting knowledge: my suggestion is that you read the core class on fitting that I linked above and then fiddle a bit around PyFa... Maybe ask someone in your Campus too to help you wrap your head around and then feel free to join us!